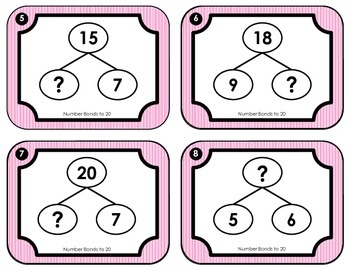 The task cards in this product are designed to help students develop an understanding of part-part-whole relationships, thus enhancing their fluency for addition and subtraction within 20. The tasks are aligned with the first grade CCSS 1.OA.C.6, along with the second grade CCSS 2.OA.B.2. 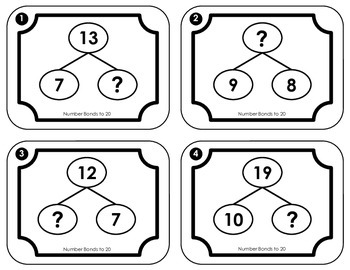 In this activity, students will identify the unknown whole or part in a number bond and record their answers. 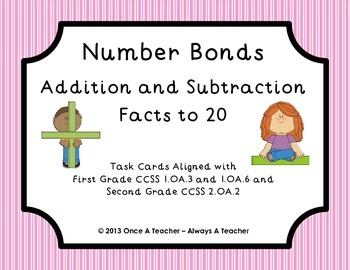 To extend the activity, student may be asked to also record a number sentence using the numbers in the number bond. To allow differentiation in student’s required answers, two different recording sheets are included One sheet requires students to only write the number missing from the number bond. 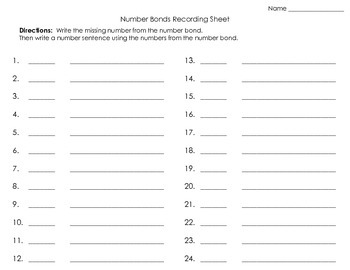 The other recording sheet requires students to write a number sentence using the numbers from the number bond, in addition to providing the missing number. An answer key has been provided to allow students to check their own work. A plain sheet of paper may also be used to record students’ work.